What’s the easiest way to find out the fonts used in a webpage? Firebug or Webkit Inspector? No, that’s too complicated. It should be just a click away. 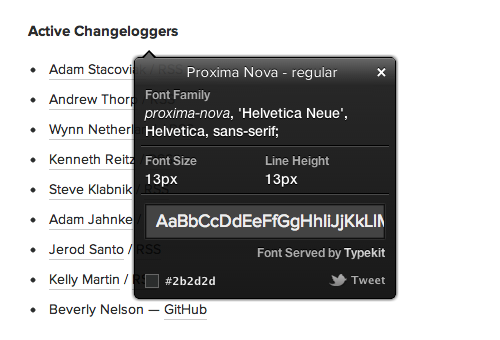 WhatFont can easily get font information about the text you are hovering on. WhatFont also detects services used for serving the font and supports Typekit and Google Font API. Check out the source on GitHub, or the homepage to learn more.